Musician Brint Anderson plays at Big Mama's Lounge|! !| a new venue at House of Blues. Pre-gaming, it turns out, is not just for sports fans. The same impulse that sees people partying together before they head into the Superdome inspires friends to meet up before the concert, preferably at an inexpensive bar located near the venue, the better to congregate and knock back a drink or two to toast the evening ahead. Few places are so well situated for this type of activity than the House of Blues, which is ringed with French Quarter watering holes. Ryan’s Pub, the Chart Room, St. Lawrence, the Kerry Irish Pub, the Jimani, even the surprisingly excellent bar at Felipe’s Taqueria – these are all good places for a group to begin before heading off to the line, the security check and the concert-priced bar that seeing a big act at the House of Blues entails. 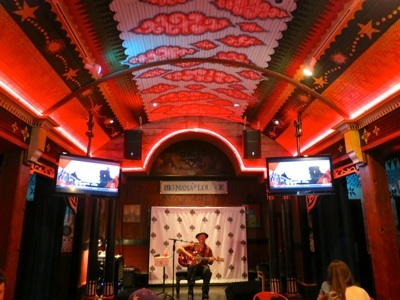 Recently, however, the House of Blues has created what amounts to its own in-house pre-gaming option and has simultaneously installed another quality bar and easy music option in this part of the French Quarter. Big Mama’s Lounge quietly opened earlier this spring. It’s located behind the club’s box office, taking over what had been a House of Blues retail shop (and don’t worry if a HOB cowboy hat is on your shopping list, the store is still open, just relocated near the restaurant inside the main hall). Big Mama’s Lounge is an intimate, pub-sized venue where there’s usually live music, no cover and a refreshingly modest price range at the bar. The small, interesting selection of draft beers go for $5 a pint and there’s a menu of basic cocktails (Dark and Stormy, Pimm’s Cup, Bloody Mary) for $5, while Sazeracs and martinis ring in higher at $9. It’s a long, narrow room with a curving ceiling like a streetcar and all of it is lined with wood, which contributes to musical sound quality. There is a distinctly House of Blues atmosphere, with the Indo/African, juke joint-meets-temple design aesthetic and the faint whiff of nag champa incense you find in the main venue. It’s definitely part of the overall House of Blues complex but can function independently of what might be happening on the big stage next door. But the reason I like Big Mama’s Lounge (the name notwithstanding) is for the way it functions as an easy, drop-in venue that showcases strong local musical talent – the bluesy kind of music that you hear while walking by and that draws you in from the hot sidewalk for a spell, even if you were on your way to someplace else. This is a happy hour kind of place, regardless of the time, or a stop on a daytime spin through the French Quarter, one of those Sunday fun days. It all feels tucked away, with the appeal of a place you just found instead of planned a visit around. To see what I mean, check out Washboard Chaz playing there with his blues trio this Thursday, May 30, beginning at 6 p.m.
On Saturday, June 1, a pair of local singer/songwriters are on the bill, with Omaira Falcon at 3 p.m. and Kelly Love Jones at 8:30 p.m. On Sunday, June 2, Carlo Ditta and Smoky Greenwell have the stage at 6 p.m.
Blues picker Brint Anderson held down a lovely run of Sunday afternoon sets, and he continues here on assorted Sundays in June. The hours here are limited, opening at 5 p.m. Thursday and at 11:30 a.m. from Friday through Sunday.